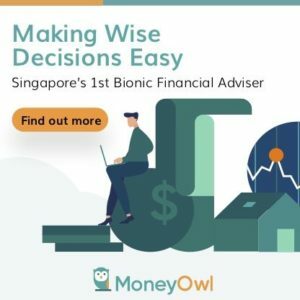 There is this article from Clear Eye Investing I would like to share. It touches on some problems that I observed recently during the REIT ran up as well as some investors. There is an absence of looking at the importance of valuation. In most models the much discussed aspects have been the Business, the Cash Flow nature, and the operation conditions. With that in mind, a stock like SATS with a business model that does seems very sturdy when it was announced we will have terminal 4 and 5. Some will look at 4-4.5% as a good return with a 3% growth rate and buy based on that premise. At times the share price of 3.40 could have already baked in a 4% yield growing at 3%. In fact, to be worthy of 3.40, the growth rate would need to be 7-8%. Is that possible? Perhaps. You have to be right on the conditions for it to grow above average. What happens if you overpay? Consider two investors that each invested $100,000 in dividend portfolios with 5% starting yields. Over the course of ten years each investor realizes annual dividend growth of 3%. 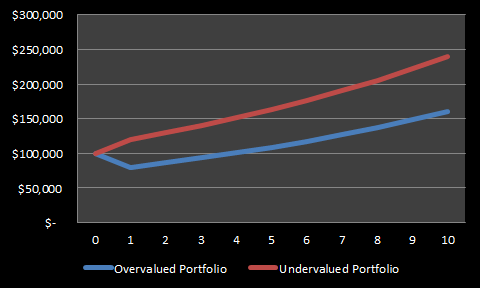 The first investor (blue line) bought stocks that were considerably overvalued and subsequently lost 20% in capital value in year one; alternatively, the other (red line) invested in stocks that were undervalued and gained 20% in capital value in year one. At the end of ten years, both portfolios generated the same amount of dividend income ($57,319), but their ending capital values are nearly $80,000 apart ($159,920 vs. $239,880). It’s hard to imagine that the two investors would feel equally good about their performance even though they realized equal dividend income over the ten year period. Dividend is only one kind of shareholder return. An asset listed price on the stock exchange could have baked in that X no of years of cash flow yield growing at Y% + a Z amount of premium. Don’t think you guys would like to pay $2000 for a IPAD (Which is a great product). I am agreed that we should look for dividend stock that come with potential dividend growth,typically low payout ratio, my bet on silverlake … It already grew to 6%base on my initial cost (was 3-4% at that time)….hoping to add more Vicom in coming months …. Can you explain why to be worthy of 3.4, the growth rate would need to be 7-8%? Hi green rookie, not as a dig at SATS but mainly using SATS as an example here.